John Deere roll-out bucket offerings provide an additional 34 inches of dump reach. John Deere has introduced a new line of roll-out bucket offerings: the RB72, RB84 and RB96. These models are designed to best match the attachment to the machine, whether operators are using a G-Series Compact Track Loader or K-Series Compact Wheel Loader (RB84 and RB96 only). When fully extended, the buckets provide an additional 34 inches of dump reach. Each bucket uses the compact wheel loader or compact track loader’s auxiliary hydraulics to roll out and dump material. This allows it to achieve a higher dump height, resulting in more efficiency and productivity. "From loading tall Total Mixed Ration mixers in ag applications or elevated truck beds, our new roll-out buckets allow customers to lift higher and get more done in a workday," said Jessica Hill, program manager of global attachments at John Deere. 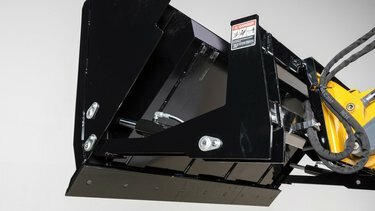 "Our unique hydraulic design is ideal for customers loading light materials when a machine's lift height is limited." The buckets pivot near the cutting edge for additional dump height, and they provide 114 degrees of roll-out for enhanced material spillage control. They are constructed with high-strength, large-diameter pivot pins for more durability. For ease of use, operators can use the self-cleaning Quik-Tatch™ attachment system with each of the buckets. This allows them to switch from one attachment to another within a matter of seconds. More information on the RB72, RB84 and RB96 can be found by visiting www.JohnDeere.com.